At Seurasaari we saw some intriguing shoes made of woven Birch Bark…they were tucked under the bed, but the interpreter kindly drew them out so I could examine them more closely and take a picture. Constance was tempted to sit in one to get her picture taken, but it was a museum after all, so we just looked. 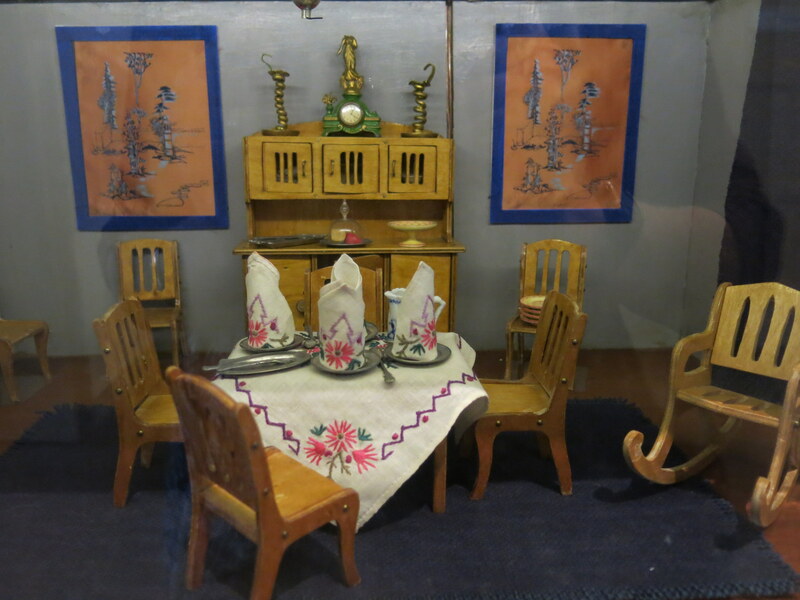 A few days after the trip to Seurasaari, we visited the National museum where many fascinating things are on display, including several dollhouses. We spent quite some time with our noses pressed to the glass, admiring the handiwork and acquiring ideas. 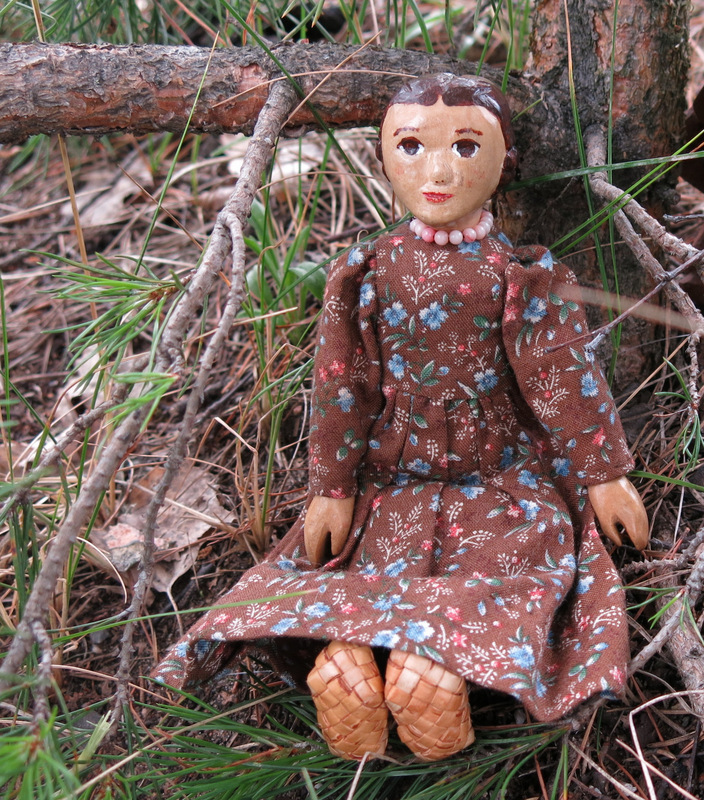 We admired the birch bark floor mat, and the very small waffle weave towel in the bathroom of one of the dollhouses…..then Constance noticed and began to covet the wee tiny Hitty-sized birch bark shoes! Amazingly, when we went hunting for hand made crafts in the public market in Helsinki, we found a pair of mini shoes exactly the right size for Constance! All of these lovely birch bark things were woven by G. Lottanen, and were being sold by her daughter. Constance spent the rest of the trip with these beautiful shoes on her happy feet. The shoes are called Tuohivirsut in Finnish! The results of a good day’s shopping – Constance’s Tuohivirsut; the cheerful Linen cloth handwoven by Ulla Ahonen and also purchased at the market in Helsinki; and the little oval birch bark container which has a pricked folk design and wooden base and lid – which we found in a Helsinki Thrift Store! Oh Constance you have such very very good taste…and the good fortune to be the traveling companion of your intrepid person! Loved everything and esp those coiled (?) candle stands on the mantel of the doll house. 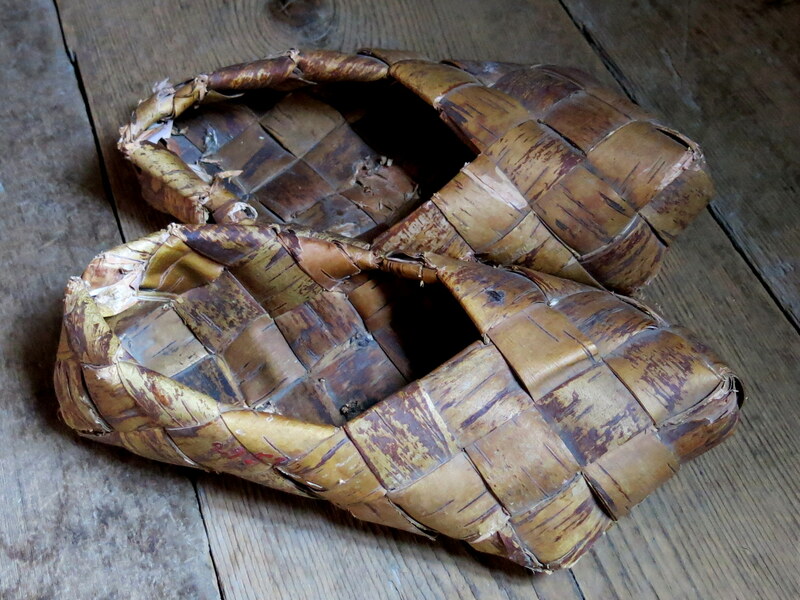 And of course those birch bark shoes!! Amazing.. I am glad you are peering through the electrons admiring the handiwork and finding inspiration – you know I hadn’t noticed the candlesticks till you mentioned them! It was lucky the National Museum allowed pictures! The mini birch bark shoes in the dollhouse caught my eye right away. How fun that you were able to buy a pair for Constance. She will be the envy of all her sisters at home and any of our Hittys who see her photos! I can see my Hittys asking for something similar woven from palm fronds. We were so excited to find some in the market. Luckily I snapped them up because although there were bark shoes here and there in other markets, I didn’t see any other Hitty-sized pairs the whole time I was in Finland except in dollhouses. Those shoes are absolutely perfect for Constance, and her human! So too are linen fabrics and the like. How wonderful to find those shoes, just when Constance had a pair in mind. It is broadly suspected in Quimperhittyville that Constance, and her human, love shopping for shoes better than practically any other kind. Other people seem to like making tiny shoes – we just notice and acquire them! Thank you for sharing the museum-going and shopping experiences. Finland seems to be a destination, and not just a stop-over country! We loved Finland – it was an uncrowded, clean, polite and interesting place in July… I haven’t visited in the winter, but I imagine it would appeal to people who like winter activities. the little doll furniture. I have never seen coiled candlesticks before. 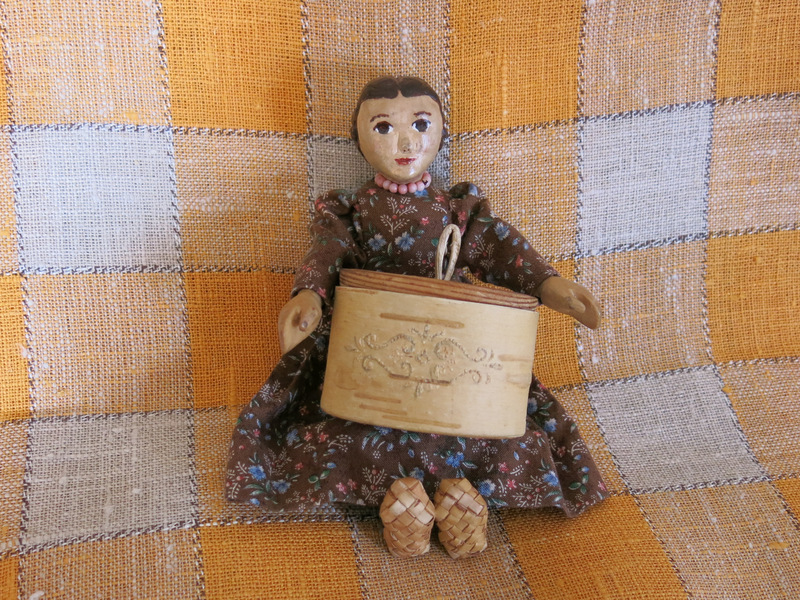 Constance can use the birch bark container to store many of her wonderful trinkets and other things. That linen cloth is also very pretty. 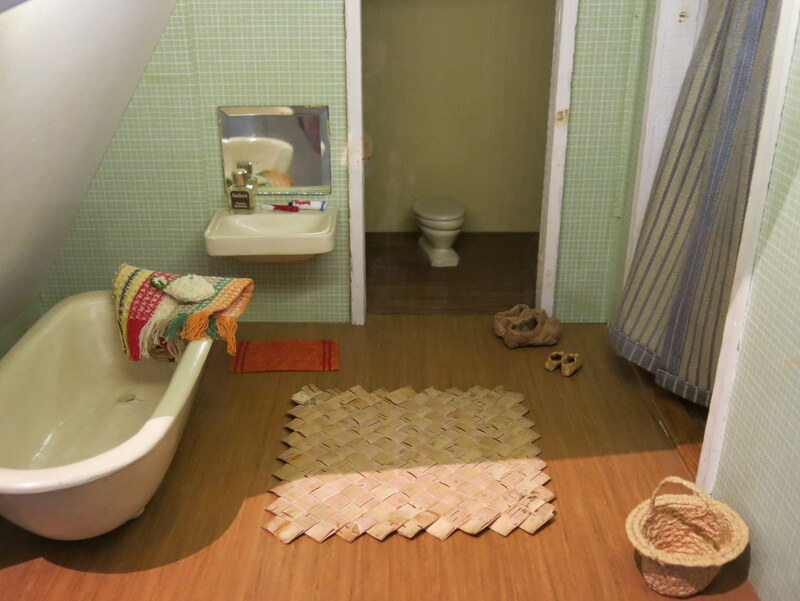 Funnily enough, I was focussed on the textiles in the dollhouses: curtains, tablecloths, floor rugs etc. I am glad to have taken these pictures, it nice to see the Pictures and notice more details than I noticed at the time. 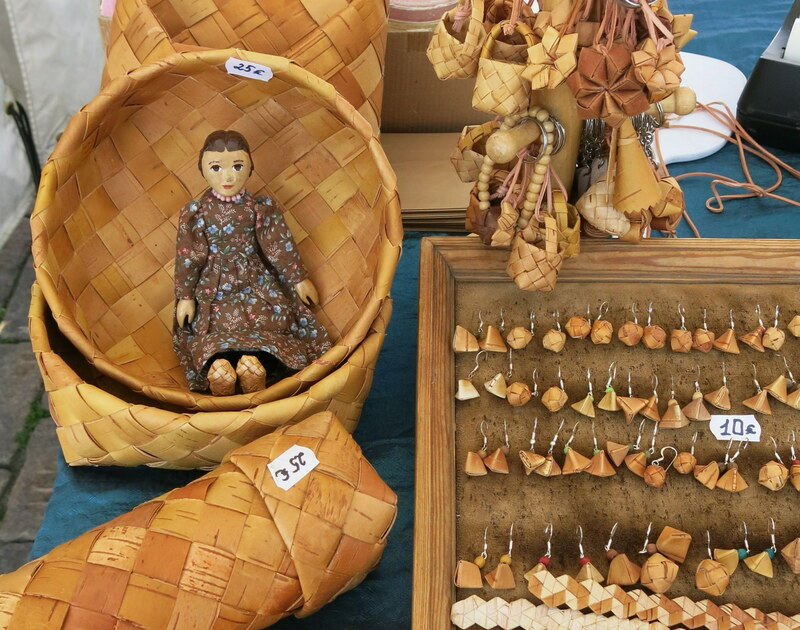 We saw the wee birchbark shoes in more than one dollhouse, but thought it was perhaps an extinct craft…and were so excited to find them for sale in the market, and exactly the right size, as though they were waiting for Constance’s little feet. Kjerstin, Those shoes one of the cutest Hitty things ever! Great find! I love the tiny woven towel too. I wonder what size loom that was woven on? Really cute. What a fabulous trip! After I found those cute shoes I felt like my Hitty shopping was complete!! HA! You were right, you won’t do any better than those shoes. It made me think about what the coolest Hitty find was from my travels. I think it would have to be the tiny whale carved from bone by an Inuit. I looked all over Alaska for more of them, but that was the only one that was the right scale. Her shoes are exquisite! And so is the basket!